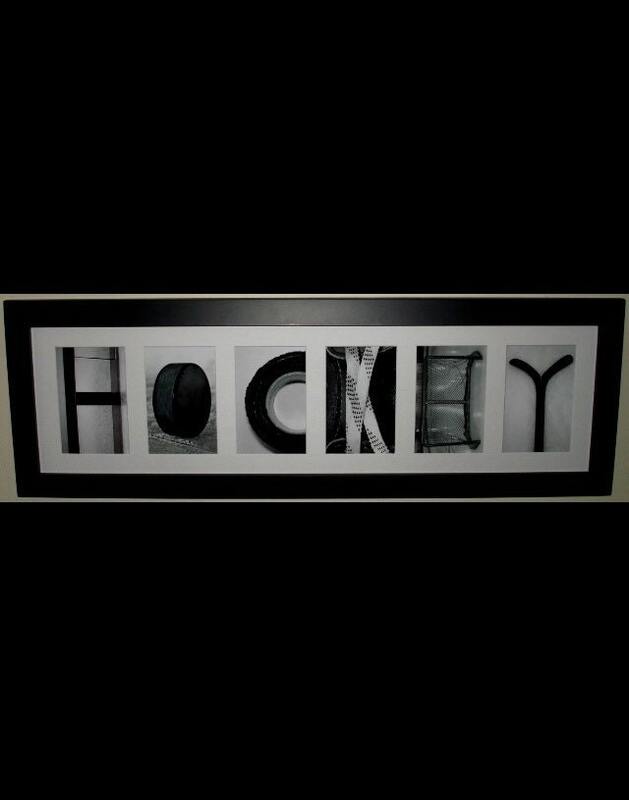 HOCKEY Frame Montage - Unique hockey photos spelling out "HOCKEY". Perfect for anyone who loves the game of hockey! This will add a great conversation piece to any room. This also makes a great coach gift and you can customize this by having the team sign it. See additional photo for example. The coach will treasure this and it will be a great way to remember the season. A hockey player could also have the team sign it and this would be a perfect keepsake to remember his/her team and their memorable season. You can easily slide the clips over and remove the back to take the mat out for signing. Just remember to have the team avoid signing the edges (1/4" around the border of the frame of the mat) as it will be covered by the frame. Distinguished black frame with white mat - 9.5" x 28"
This is sign is better than expected! It is going to look so amazing in my son’s game room that I am redecorating for Christmas in all hockey decor! Wow! I didn't know that I would be able to get this so quick! It is beautiful and carefully wrapped. Our hockey coach is going to be so excited when we give it to him! Thank you! Totally happy with this purchase. Came very well packaged and timely. Larger then I expected. Great price! Great quality! Highly recommend! !